A search for a priceless artifact stolen from the Second Temple in Jerusalem becomes a race against time, terrorism, politics, and the past. Jonathan Marcus is a promising young archeologist studying at the American Academy in Rome when a terrible accident results in a fellow student's death and Jonathan's expulsion. He abandons archeology for the law, becoming a skillful advocate for unscrupulous antiquities dealers. When Jonathan's firm sends him to Rome to discredit the testimony of a prominent U.N. antiquities official, a chance reunion leads to a hunt for the legendary Tabernacle Menorah: solid gold, eight feet high, stolen 2,000 years ago and never recovered. 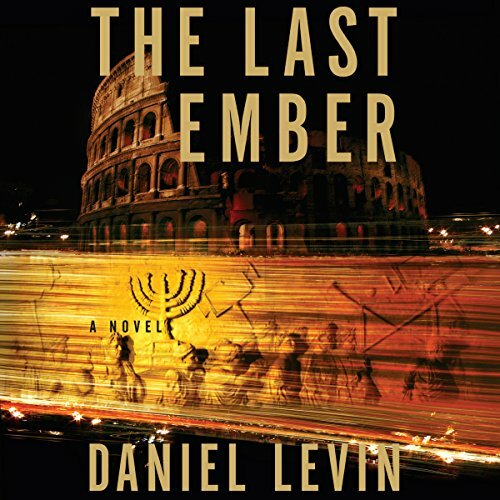 As Jonathan and his friend scour Rome's ancient sites for hints to its whereabouts, they quickly realize they are not alone and the precious menorah is a key to controlling history itself. I'm not one to usually write a review, but this book blew me away. If you, like me, were disappointed in the recent Dan Brown novel, here is your redemption. Full of rich history woven into an intricate story, this book will hold you from beginning to end. A great listen. If you like Dan Brown, you will like this book. Very much in the same spirit. I enjoyed listening to this. Where does Last Ember rank among all the audiobooks you’ve listened to so far? Like the historical mix and the story line. I like religious historical novels. Levin does a great job. Waiting for his next novel. One of the best books that I have read or have listened to. Fast paced, unpredictable, entertaining, and educational. I love novels with a history background, and this subject matter is outstanding. While reading/listening to this book, I googled many of the historical references, and found the story background to be true, and very fascinating. Levin has written a novel with the same quality as Steve Berry, James Rollins, and Clive Cussler. One thing I would like to see Levin do in future books is to have a chapter at the end of the book to explain what is true, and what is factious, like Brown, Berry and Rollins. It kind of puts a finishing touch to their novels. All in all, a great book. ...having trouble pressing play, due to: wooden lead characters [Jonathan and Emily]; almost complete absence of humor; an excess of exposition, more exposition and finally lots and lots more exposition. Ouch. There are moments when it shows promise, and certainly many of the historical threads fascinate. But when the cardboard protagonists come together in the presence of all these rich cultural artifacts and treasures, I can't concentrate. It's a bit liking setting Joe Hardy (of the "Boys" of the same name) and Nancy Drew against the backdrop of a Dickens novel or smack dab in the heart of the New Testament. Here's an idea: Could Levin write a work of non-fiction? Yes! Should he scrap the novel as a viable form of getting his wonderful historical material across? Yes! For now, I will get my history from masters of the fictional form such as Bryce Courtenay and Ken Follett or from pure non-fiction like the awesome (and lengthy) Gandhi & Churchill I just finished by Arthur Herman or anything by Ben MacIntyre. At first I thought this was a sure 5 star book. The action is good and the narration was great through the entire book. By the middle of the book, though, you start to want more depth in the plot. At the end of the book I started to get disappointed in the one dimensional plot. Almost gave it 3 stars, but being the first book (and the narration was great), I think 4 stars is a better rating with a hope that the next book is somewhat more complex in plot. If the next book is another ancient roman historical intrigue, I would probably pass. This is my favourite novel in this genre. The tour through modern day and Ancient Rome is a thrill! Great suspense-history-archeology action a-la "national treasure" style about the Holy Temple Menorah. Good background details and interesting characters.